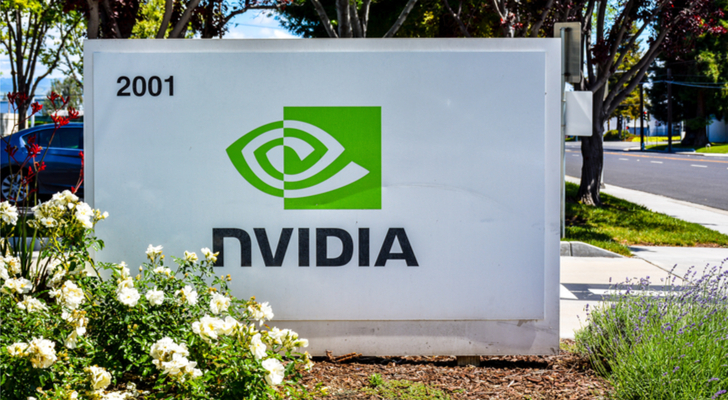 If we’re still in the midst of a stock market correction, someone forgot to tell Nvidia Corporation (NASDAQ:NVDA). While the market has fallen 6% since its late-January apex — dipping more than 10% at one point — Nvidia stock has actually gained steam. The NVDA stock price is currently around $240, near where it was when the market started to crater, and just off a new all-time high. That new high came on Tuesday, after NVDA gained $5. However, as its performance of late suggests, Nvidia stock seems relatively impervious to the new volatility on Wall Street. Tuesday’s jump to $249 could mean the beginning of yet another break higher for NVDA. That seems hard to believe for a stock that has already more than doubled in the last year and trades at 51 times trailing earnings. But it’s not so hard to believe when you look at the company’s expectations for future earnings. Analysts expect 83% EPS growth and 49% sales growth in the current quarter, plus 35% full-year earnings growth in 2018 on top of 27% sales growth. Those figures would fall short of the chipmaker’s performance in its last two fiscal years. But they are more than enough to trigger additional buying for a stock that trades at just 34 times forward earnings estimates. Recent history suggests that once Nvidia stock gets going, it makes a big push in a small amount of time. In September, NVDA rose 15% in six trading days. In October, the stock popped more than 7% in nine trading days. And last month, the stock vaulted 15% in five trading days. Tuesday’s move up to a new record high is a pretty good indication that another big break in Nvidia stock could be close at hand. Thus, if you’re looking for some short-term profits in a stock that’s been consistently red-hot for the past two years, now would be a very good time to buy into momentum. Longer term, there’s also a lot to like about NVDA stock. Demand for its core product, graphics chips, continues to skyrocket thanks to the rise of cryptocurrency and the ever-expanding gaming industry. Meanwhile, the chips the company is making for self-driving cars could be a sleeping giant should that industry take off the way many expect, though autonomous-driving revenues were down 15% in 2017. The company expects its transition from infotainment chips in self-driving cars to artificial intelligence cockpit systems to start to bear fruit in 2019 and 2020, when automakers, ride-hailing companies like Uber and taxi companies really start using autonomous-driving capabilities. Thus, Nvidia’s one weakness last year could become a big strength in the not-too-distant future, providing yet another revenue stream. Can the NVDA stock price double in the next 12 months the way it did in the previous 12? Perhaps not. But this diverse chipmaker isn’t nearly done growing, and the valuation looks reasonable compared to the expected growth in the coming year. With technical momentum on its side, I wouldn’t wait around for the next 15%, five-day jump in NVDA. I’d buy now and potentially hold on to it for years to come. Article printed from InvestorPlace Media, https://investorplace.com/2018/02/another-big-breakout-could-be-days-away-for-nvidia-stock/.